Our staff at The Barn tends to joke that all of our brides are either related or they were friends in college... Today's bride just so happens to be Stacy's cousin (we just featured her wedding last week! ), and she's also from the same town out in western Oklahoma as Morgan + Wager, which is where she heard about our little ol' barn here in Arkansas. The best advertising is by word of mouth, and we are always so thankful when our brides send their old friends/cousins/sorority sisters our way! 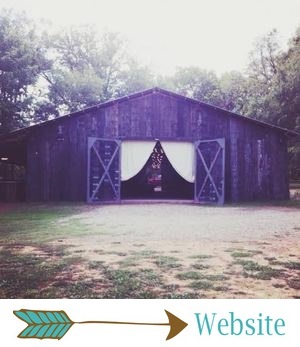 But get this - Nikki and Stacy were both planning to get married at The Barn without realizing the other was planning their wedding here, too! Anyway, Nikki and Mac eloped at The Barn last month, and it was a vintage-country-rustic-woodsy dream wedding! Their photographs by Callie Kirtley Photography are full of beautiful colors and details, and we're crazy about them! Nikki and Mac were married at The Barn at Twin Oaks Ranch on April 14, 2018. They chose a spring-inspired color palette of pinks, mint, white and a touch of orange. "Mac and I have different themes of what we were wanting, but they were close enough to combine them," Nikki said. "He liked country and woodsy and I liked vintage and rustic. So it came out perfect for our styles." We were crazy about Nikki's amazing mermaid bridal gown, which was from David's Bridal. I absolutely love the beautiful ruching (literally the most flattering dress ever), the gorgeous train, and the floral belt, which tied so beautifully at the back. Nikki, you are a dream! Nikki's bouquets were the perfect spring florals - full of gorgeous, bright spring colors. "My bouquet was exactly what I had asked for, full and colorful," she said. "I loved all the different colors and the different greeneries that were used." There were bits of honeysuckle used throughout their florals and decor, which was one of Nikki's favorite details. "Because of that we are now planting honeysuckle in our flower beds as a little reminder of our special day," she said. This will be the sweetest reminder of their wedding day! Nikki and Mac chose to have a first look before their ceremony, to get all their butterflies out and to spend a few sweet moments alone beforehand. Nikki said the first look was one memory they would never forget! "Mac was pretty nervous about everything so we chose to do a first look to ease both of our minds," she said. "Those few minutes where we had both seen each other all dressed up and ready to go were very memorable for the both of us." Nikki and Mac's ceremony was a little bit rustic, a little bit vintage, and so romantic. 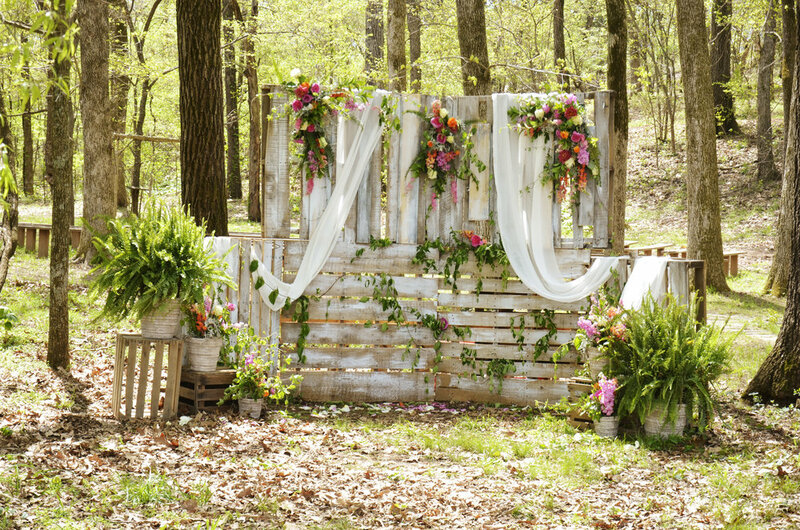 Their altar was made up of whitewashed pallets, which were draped with flowy white fabric, honeysuckle and colorful florals. The flowers gave it the perfect pop of color, and the ferns, greenery and potted flowers made it perfect for spring. Our elopement receptions include a super detailed cake table with the cutest cake ever (these cakes are seriously always the cutest! ), as well as any add-ons you might need. Nikki and Mac kept it simple and sweet with a cake and drinks to toast with. This hanging pallet cake display was everything! The honeysuckle coming out of the pallet, the adorable white cake with colorful florals, the vintage lace, and even the cute pink straws in their cups. Every detail was sugary sweet! It's no secret that I'm a sucker for wedding day portraits of our couples. These are precious, and they show off the gorgeousness that is spring at The Barn! Y'all are pretty, Nikki and Mac. These are amazing! Nikki and Mac went on a Southern road trip for their honeymoon! "We drove to West Monroe, Louisiana the first night then on to Orange Beach, Alabama where we stayed on the beach for two days," Nikki said. "From there we moved up to Nashville, Tennessee for one night to see the Grand Ole Opry and walk downtown Broadway then traveled to Memphis, Tennessee to stay at Big Cypress Lodge for one night as well, which turned out to be our favorite spot on the whole trip."